Monday evening, U.S. Senator Joni Ernst (R-IA) took to the floor of the United States Senate to call for support of the Pain-Capable Unborn Child Protection Act – which would ban abortions after five months of pregnancy – and share the story of the Pickering family from Newton. Micah Pickering was born prematurely at approximately five months and has grown to be an energetic three-year old boy. 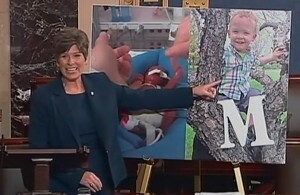 This legislation stands to save up to 10,000 lives like Micah’s per year by banning abortions after about five months of pregnancy – a stage of development at which evidence shows unborn babies can feel pain and may survive outside the womb with appropriate medical care.